Welcome to the online home of Diffusible Iodine-based Contrast-enhanced Computed Tomography. Our mission is to provide digital resources for the diceCT community and to connect interested researchers with contrast-enhanced imaging veterans. Watch this space and @diceCT for updates on new publications, tips & tricks, and diceCT-related events. The Museum für Naturkunde and YXLON are partnering to deliver an Imaging Technology Symposium, June 12–13th 2019 in Berlin! The symposium will bring together users of CT technology from biology, morphology, paleontology, zoology, and related areas to share their expertise and knowledge about exciting developments in biological imaging. A hands-on session by YXLON with their FF35 CT scanner (on June 14th) will follow the 2-day symposium. The scientific program will consist of lectures from international scientists in the field as well as practically focused, hands-on and workshop sessions. 30 months after the Journal of Anatomy published the eponymous and open access diceCT review, we have crossed the 100 citations threshold! The Austin Working Group is thrilled to see how a community of passionate, creative, and clever researchers—spanning the globe—have come together around contrast-enhanced imaging tools and diceCT in such a short time! We’re particularly proud of the open nature of the community, sharing tips and tricks, successes and failures with each other and with newcomers to the field. You have helped to catapult the success of 3D soft-tissue imaging from a comparatively low-resolution, expensive diagnostic tool to an accessible, next-generation research visualization platform. DiceCT facilitates the rapid visualization of both external and internal brain anatomy in vertebrates – alongside the intact bones of the skull and the complete, undisturbed pathways of peripheral nerves, up to and including the target organs that they innervate. This approach allows for the digital extraction of vertebrate brains across 10,000-fold ranges in specimen size and at micron-scale resolutions. Mid-sagittal section of museum specimen of Glossophaga soricina (Pallas’s long-tongued bat) head after three weeks in I2KI stain demonstrating complete penetration after only several weeks in stain. The black space surrounding the brain shows the degree of shrinkage. Anatomical structures are outlined for orientation. Scale bar = 4 mm. 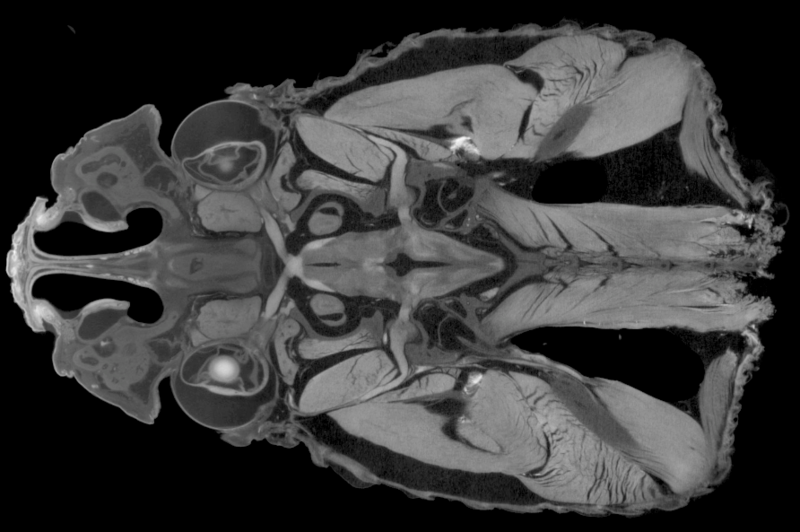 DiceCT allows visualization of organismal soft-tissue cheaply and non-destructively, thus giving comparative biologists a new toolkit for assessing morphological variation. Comparative morphologists primarily use museum collections to visualize features across a wide range of species, but the consequences of preparation and storage are not well understood. We report soft-tissue shrinkage in the brains and eyes of five bat species from museum collections and compare this to shrinkage found in specimens of six freshly-collected species. Although the magnitude of shrinkage in the museum specimens did not increase over four weeks of stain time in iodine, the brains and eyes of museum specimens shrank considerably prior to placement in iodine in comparison with field-collected specimens. While the cause of shrinkage in these specimens remains unknown, we caution against study designs that combine fresh and museum specimens. Read more about using diceCT with museum specimens at Microscopy & Microanalysis! Neoceratodus forsteri, develoment of branchial arch muscles. Top row: Sagittal sections; Levatores arcuum branchialium I-V (LAB I-V) attaching to ceratobranchiales (CB) I-V (anterior is left; stage 52/53) . Bottom row: Branchial arch muscles in in a juvenile N. forsteri, diceCT images, sagittal images; LAB (I-V) (anterior is left). See publication for details of histological staining; scale bars are 1 mm. Read more about Australian lungfish at the Journal of Morphology and see more work like this on ResearchGate and at PLOS ONE! Head over to Frontiers in Neuroanatomy to read the pub and see more research on Twitter! Traditional methods get paired with new imaging techniques to advance the study musculoskeletal biomechanics, featured in the February and March 2018 Special Issues of The Anatomical Record edited by Hartstone-Rose and his colleagues Sharlene Santana, Damiano Marchi, & Jeffrey T. Laitman. 3D diceCT models and histological sections through the calcar of (a) Myotis californicus, (b) Artibeus jamaicensis, (c,d) Molossus molasses. Specimens were stained with Lugol’s iodine for contrast-enhanced X-ray µCT imaging, subsequently destained by leaching in 70% EtOH, and re-stained for histological sectioning using Modified Mayer’s Hematoxylin and Mallory triple connective tissue stains. Abbreviations: Ca, calcar; m.A, additional muscle in M. molossus; m.CC, m. calcaneocutaneous; m.D, m. depressor ossis styliformis; m. DP, m. depressor ossis styliformis profundus; m.DS, m. depressor ossis styliformis superficialis. See more of this research at the Bat Cave on Twitter, the Santana Lab website, and read the the pub at The Anatomical Record! Follow Dr. Kolmann on Twitter, and head over to Royal Society Open Science to read the open access pub! Find more methods integration at the Ross Lab website, and read the pub at The Anatomical Record!